Do you love travelling to Italy? Are you passionate about Italian art, fashion and cuisine? Are you considering moving to the ‘bel paese’? Then speaking (a little) Italian should be a must for you. Here are our list of 6 reasons why you need to master the language. Learning a new language brings you amazing advantages. It will broaden your own perspectives through self-discovery, boost your problem solving abilities and improve your memory. But it not only makes the brain more efficient, it also preserves it from premature aging as indicated in some recent research published in the “Journal of Neurolinguistics” conducted at the University of Montreal on a group of volunteers whose average age is around 74 years. Don’t confine yourself to the ‘tourist experience’, even if you’re just travelling. Learning Italian will help you live a more authentic adventure. You’ll be able to order food with confidence and understand what you’re eating. You’ll be able to read signs and ask for directions or book a taxi by yourself. What’s more, a tourist who makes an effort to speak Italian is immediately welcomed into the warmth of the community… because Italians frequently don’t speak English, or any other languages (yes, that’s a cliché, but it’s true!). Have you ever dreamed of waking up to be greeted with an Italian lifestyle? Speaking Italian will make the friendships you missed out on previously, possible. You can start with small talk – locals will be impressed you’ve made the effort. They’ll take you to delightful places only they know about and you’ll experience Italian culture and traditions otherwise you couldn’t access. Italy not only has a great artistic heritage to discover, like marvellous cities full of art — Rome, Pisa, Florence, Venice and the list could go on forever — but it also boasts some of the world’s most beautiful literary masterpieces like ‘The Divine Comedy’ by Dante Alighieri. So knowing Italian means you can read them, or watch movies by Fellini, Visconti and Pasolini in their original version. It’s the only way to fully experience their perfection. Only by learning Italian you can understand their true meaning. 5. Open yourself up to new business opportunities! It may give you a boost in your career in the culinary arts, fashion, travel, graphic design or robotics, for example. Have you ever thought about that? Or it could be the key skill you need to apply for that job you’ve always wanted. Italian is widely spoken in Switzerland, some areas of Croatia and Slovenia, Malta, Corsica and Albania, and you’ll find Italian immigrant communities in more than 23 other countries all over the world. You never know when it could turn out to be useful. And did you know that it is the fourth most studied language in the world? 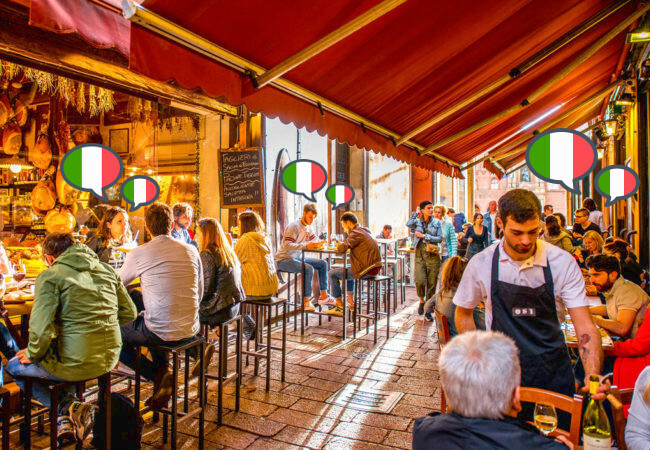 This doesn’t come as a surprise if you think about how much Italian words are used every day outside of Italy: pizza, cappuccino, spaghetti, espresso, mozzarella, pasta, dolce vita… need we go on? Italian is everywhere! Last, but not least, for those dreaming about their perfect home in Italy, mastering the language means being able to understand every aspect of the purchase process and communicating more easily with the agent, the vendor, or any other people involved. So you’ll also be able to avoid many mistakes or pitfalls more easily. Your Guide to Italian Emotions. Evviva! Avoid These 5 Common Fatal Errors And Speak Italian Like a Local Live in Italy, Speak Italian, Be Italian! Do You Speak Italian? Learn It with Us!